Turkish Foreign Minister Mevlut Cavusoglu on Friday assured Pakistani counterpart Shah Mehmood Qureshi of his country's support in the bid to find a peaceful solution to the Kashmir issue. Cavusoglu, who arrived in Islamabad on Thursday for high-level discussions with Pakistani officials, held a meeting with FM Qureshi at the Foreign Office today, following which the two addressed a joint press conference. FM Qureshi said that Turkey has agreed to support Pakistan's bid for a peaceful resolution of the Kashmir issue at the UN. "At the United Nations conference there will be a separate conference on Kashmir on the side. It happens every year but it is different this time because a new UN report has come out which sheds light on the India-occupied Kashmir. "There has certainly been a surge in the interest of people in the human rights abuses that are taking place there. I invited FM Cavusoglu to that conference, and I am thankful to him that he accepted the invitation." Cavusoglu said that it's Turkey's wish that the Kashmir issue involving India and Pakistan gets resolved the UN in a peaceful manner. "In the group that has been formed over Kashmir in the UN, we will stand with Pakistan and try to make [its efforts] successful." FM Qureshi said that ways to enhance economic and commercial ties with Turkey were also discussed in his meeting with Cavusoglu. 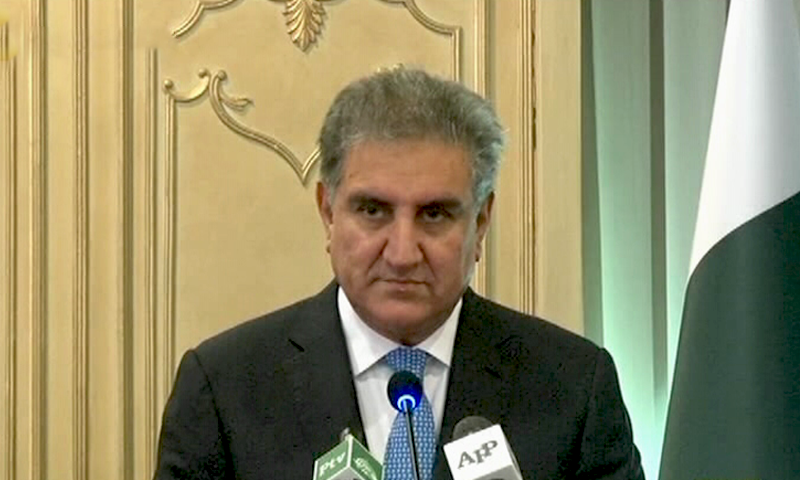 "In our meeting today we focused on enhancing our economic relations," FM Qureshi said. "[We discussed] ways to facilitate each other. "Our relationship has been very strong. There is a mutual interest. We understand each other's sensitivities. Turkey has played a role in improving regional consensus and stability. "They also have a trilateral arrangement, which we can be used to further improve our regional stability and connectivity." "I got the chance today to thank the Turkish FM for supporting Pakistan's membership in Nuclear Suppliers Group (NSG). On the Netherlands caricature issue as well, Turkey supported us." "Governments and people come and go, but real friendships cannot end," Cavusoglu said. "This friendship should remain forever. "In today's meeting I discussed a lot of issues with FM Qureshi. The most important aspect of our discussion was on the strategic council, the sixth conference of which — God willing — will take place in Pakistan, and we will do all we can to make it happen. "We have strengthened our commercial ties, and [decided to facilitate] our companies that want to work in Pakistan." "We have a unique relation, therefore, we should work together to further enhance our relations. The security issue for both the countries is important and so is the economic and military cooperation." FM Cavusoglu said that "there is a propaganda against Islam in Europe. We ran a campaign against the Netherlands caricatures, and thank God they shut it down." 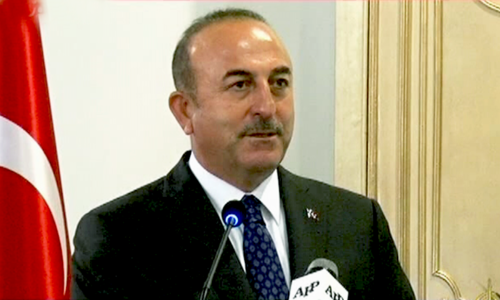 Cavusoglu said that "Turkey will never forget Pakistan and its people's help" in the failed 2016 Turkish coup d'état attempt. "The Gulen movement not only damaged Turkey but it caused destruction wherever it went," he said. "Pakistan helped us in that and we would for it to keep doing so." The Turkey’s foreign minister, who is here to convey the greetings of President Recep Tayyip Erdogan to the PTI government, called on Prime Minister Imran Khan on Friday. Cavusoglu reiterated Turkey’s full support to Pakistan government’s future plans to “take the country on a rapid course of economic progress, developments and creating greater opportunities for the people of Pakistan, especially its vibrant youth”, read a statement issued by the PM Office. PM Khan stated that Pakistan and Turkey were bonded by common faith, mutual interest, and a shared future for the people of the two countries. “Both countries have always stood beside each other and would continue to do so,” he maintained. Turkish FM Cavusoglu, following his meeting with FM Qureshi, called on Chief of Army Staff Gen Qamar Javed Bajwa at the General Headquarters in Rawalpindi. "The focus of the discussion remained on Pak-Turkey relations and regional security, including the evolving situation in the Middle East, management of defence and security cooperation between both the countries," according to the Inter-Services Public Relations (ISPR). The Turkish minister, the ISPR said, "acknowledged and appreciated Pakistan’s contributions for conflict prevention in the region, and also pledged to keep working for better relations between the two brotherly countries".